Tomorrow is the Feast Day of Saint Bernadette, who is often depicted in prayer with a rosary or appealing to the Holy Virgin. She was beatified in 1925 and canonized by Pope Piuis XI in December 1933. Saint Bernadette is the patroness of illness, people ridiculed for their piety, poverty, shepherds, shepherdesses, and Lourdes, France. With you Bernadette, WE go to the Grotto, to contemplate Mary, full of grace, to hear her say 'Do whatever he tells you'. 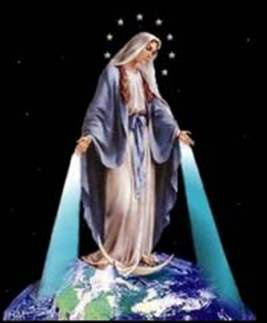 With you Bernadette, WE shall go and repeat the Name of the Lady to the World, 'I am the Immaculate Conception'. Saint Bernadette, teach us to pray to Mary each day, Mother of God and our Mother: 'Hail Mary, full of Grace'.